Good Morning! It gives me great pleasure to be here with you at the first Nordic China Smart City Conference. On behalf of the Embassy of China in Sweden, I'd like to extend warm congratulations on the opening of the conference, and extend my heartfelt welcome to all the delegates from China and Nordic countries. 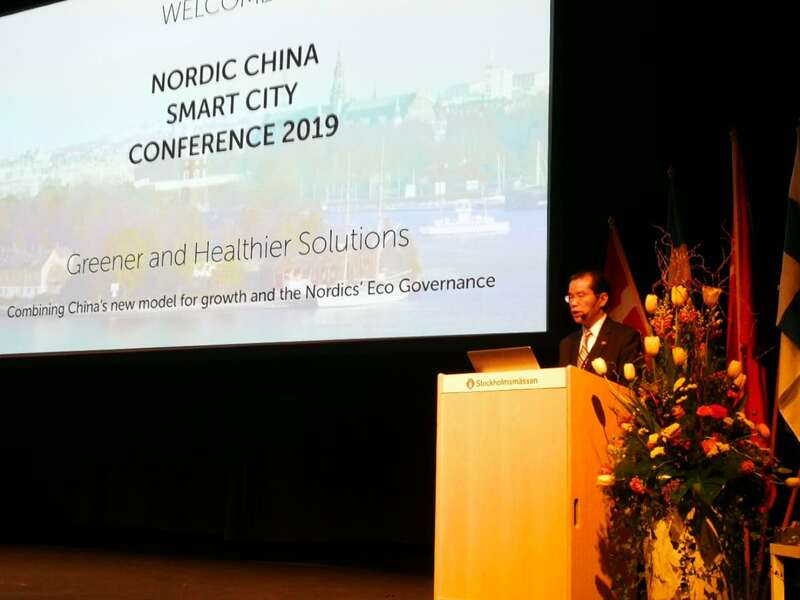 Themed "Combining the Development of China's New Cities and the Nordic Strength in Green Industries and Old Age Care---Smart City Solutions", the Conference focuses on building an important platform for China and Nordic countries to share development opportunities. Such an initiative is very timely. 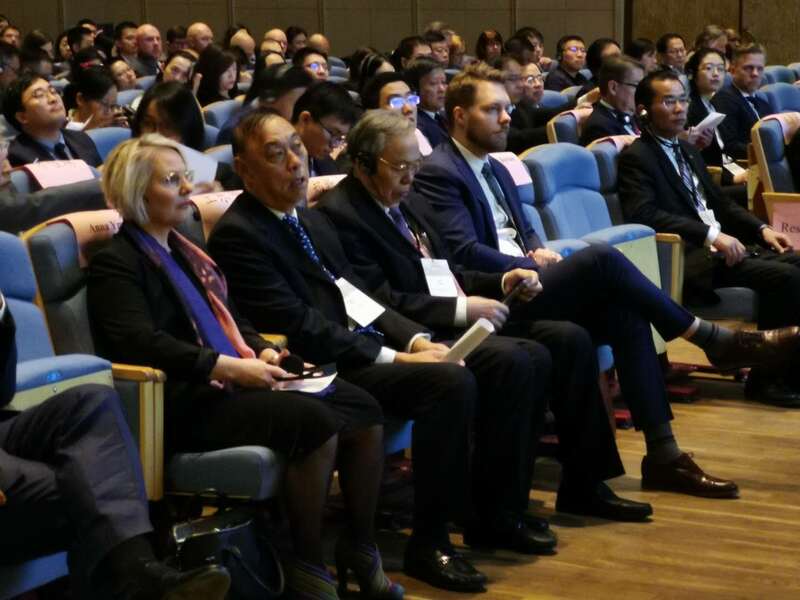 Let me pay tribute to all the organizers, partners, and participants, including the Sweden-China Trade Council, Sweden-China Green Tech Alliance, Swecare, IVL, Danish Chinese Business Forum, Norway Health Tech, and Helsinki Business Hub. I hope you will make new friends here, and reap a bumper harvest. Though geographically far apart, China and Nordic countries have a long history of friendly exchanges, and our economic and trade cooperation has yielded fruitful outcomes, making this cooperation a highlight of China-Europe cooperation. According to our numbers, trade between China and Nordic countries registered USD 43.19 billion in 2018, up 12.6% from the previous year. China's exportation to Nordic countries last year grew by 13.7%, reaching USD 21.48 billion; China's importation from Nordic countries increased by 11.4%, reaching USD 21.71 billion. As of the end of 2018, Nordic countries accumulatively invested in 3,770 projects in China, totaling USD 11.34 billion. China's investment in Nordic countries reached USD 10.38 billion. In general, the quality of bilateral trade and investment is improving, its scale growing and structure more balanced. These cooperation outcomes owe much to the shared values of China and Nordic countries, such as openness, inclusiveness, equality and mutual benefits, and to the dedication and wisdom of our business communities, as well as our unique strength in innovation cooperation. The fact that there is enormous potential for China and Nordic countries to further expand cooperation is because of the high compatibility of our development philosophies. China established a new development vision characterized by innovation, coordination, green, open and shared development, putting innovation on the top of China's development agenda and pursuing national development by focusing on science, education and innovation. Nordic countries, including Sweden, depend on innovation and have strong innovative technology capabilities. Both China and Nordic countries oppose trade protectionism, and support trade and investment liberalization. It is also thanks to the high complementarity of our economic structures. Nordic countries lead the world in technologies of environmental protection, smart cities, new energy, bio-medicine and high-end manufacturing. They boast a large number of well-known international innovation companies and high-tech SMEs that excel in their respective fields. China has a huge market, abundant professional personnel and capital, which helps break the confines of market size and development space often faced by Nordic SMEs, so that we can combine our respective strengths and achieve synergy. We need to build on our past success and further expand, deepen and elevate our cooperation. We see a world of rising instabilities and uncertainties, and live at a time when trade protectionism and unilateralism are on the rise, economic globalization encountered setbacks, rules-based international order and multilateral trading system are impacted, and more risks and challenges loom. Both China and Nordic countries are firm advocates for free trade, fair trade and WTO rules. China is willing to join hands with Nordic countries in upholding free trade and defending the authority and effectiveness of the WTO. Not long ago, China celebrated the 40th anniversary of reform and opening up. Over the past 40 years, with the support of the international community, the Chinese people made historic development achievements through their hard work. China's economic total and trade both rank the second in the world, and China, as the biggest contributor to global economic growth, has been contributing over 30% to global growth for many years in a row. Against a backdrop of insufficient new economic drivers and mounting downward pressure in global economy, China's economy still has significant resilience and a huge potential, and its trend towards long-term growth and expansion will not change. Following the trend of consumption upgrading in China, the Chinese Government takes the initiative to open up wider to the world, adopts multi-prong efforts to increase household income, nurture new medium and high-end growth drivers, and expand importation. Going forward, China will cut even more tariffs, streamline customs procedures, reduce procedural cost for importation and promote faster growth of new business models such as transnational e-commerce. The Chinese side will continue to ease market access, accelerate the opening of such areas as telecommunications, education, health care and culture, improve the legal system for foreign investment based on openness and transparency, enhance protection of IPR and build China into one of the best places to do business in the world. According to the latest Doing Business report of World Bank, China jumped 32 spots compared with the previous year. China's progress benefits from reform and opening up, and we will steadfastly remain committed to this path. It is expected that China's importation of goods and services will respectively exceed USD 30 trillion and USD 10 trillion in the next 15 years, injecting strong momentum and vitality into world economic growth. We will give priority to cooperation in areas such as sustainable development, smart cities, clean energy, life sciences, green finance, high-speed rail and space. We will strengthen exchanges in culture, tourism and winter sports, enhance personnel and research exchanges, and step up cooperation in innovation commercialization. We welcome companies in Nordic countries seizing the opportunities and sharing China's development dividends. Last but not least, I wish the Conference every success. Thank you.